If you're in the business of collecting dinosaurs, you don't want to miss this one! 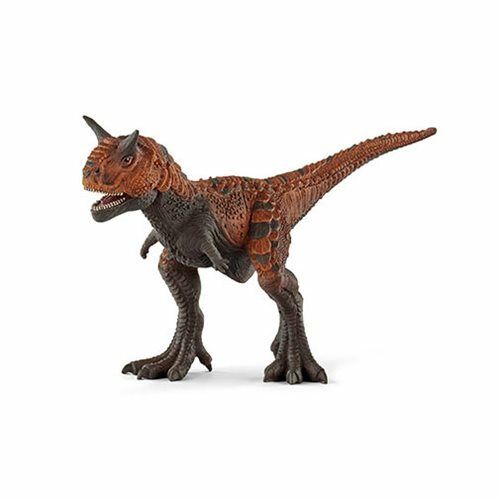 This very detailed Schleich Dinosaur Carnotaurus Collectible Figure measures about 8 7/10-inches long x 5 1/10-inches tall and features the Carnotaurus, a carnivorous dinosaur that walked on powerful hind legs and had a mouth full of sharp, long teeth. Add it to your hoard! Undoubtedly one of the most dangerous predators of its time, the Carnotaurus was a meat-eater that lived about 70 million years ago. The only skeleton ever found of it was dug up in Argentina. The monster was 30-feet long and weighed approximately 1 1/2 to 2 tons. Its snout was more rounded than that of its relatives and its teeth looked like crooked knife blades! Ages 3 and up.